Indicators assess lagoon health and guide management like a medical doctor uses a patient’s vital signs to diagnose and treat human health issues. 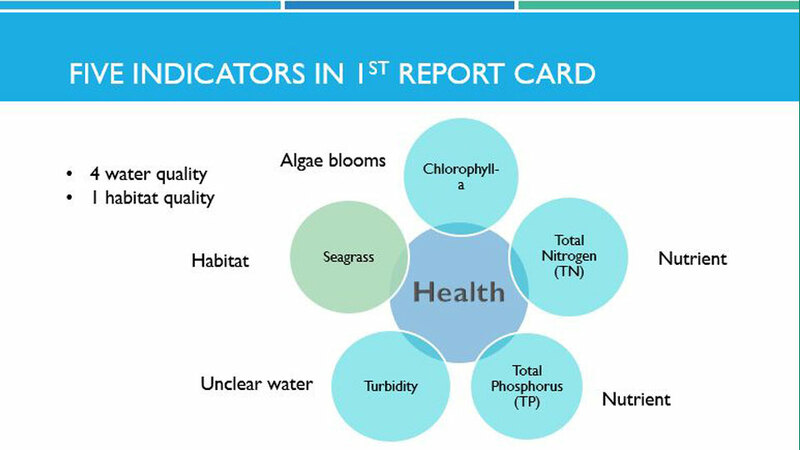 Lagoon health indicators including seagrass, nitrogen, phosphorus, chlorophyll-a, and turbidity are akin to human health indicators like blood sugar, cholesterol or blood pressure. Just as the medical field has set ranges for human health indicators, State and Federal agencies have established healthy values for these five lagoon health indicators. For a list of targets click here. The list of potential lagoon health indicators that came out of the Science Assembly included nine water quality, four habitat, and nine wildlife indicators. The feasibility of using each indicator was evaluated based on the availability of data and the presence of established regulatory or scientifically-based targets of health. To be included in the assessment, indicators must have at least 20 years of data and cover the entire lagoon. Several indicators with enough temporal and spatial representation were eliminated from the initial IRL health assessment because they lacked an established and well-vetted target of “quality” or appropriate “health” for all ten lagoon regions. These included fisheries data, bird abundance, salinity, and wetland coverage, among others. Dissolved oxygen was dropped after it was evident that sampling was not taking place in a manner that would allow it to be compared to regulatory targets. After the feasibility analysis, only four water quality and one habitat indicators were selected for the initial IRL Health Assessment: chlorophyll-a, total nitrogen (TN), total phosphorus (TP), turbidity, and seagrass transect deep edge distance. June 1, 2018 61dugong Comments Off on What Is the Muck Finders Program?